Want to work for SomeBrightSpark? We're always on the hunt for exceptional talent. If you're a creative thinker or operational expert then take a look through our vacancies and get in touch. to work and play hard. Based in Leicecster’s Cultural Quarter means we have great food, local events, and drinking holes right on our door step, and we’re minutes from Leicester’s train station. The work can be demanding but we like to look after each other. 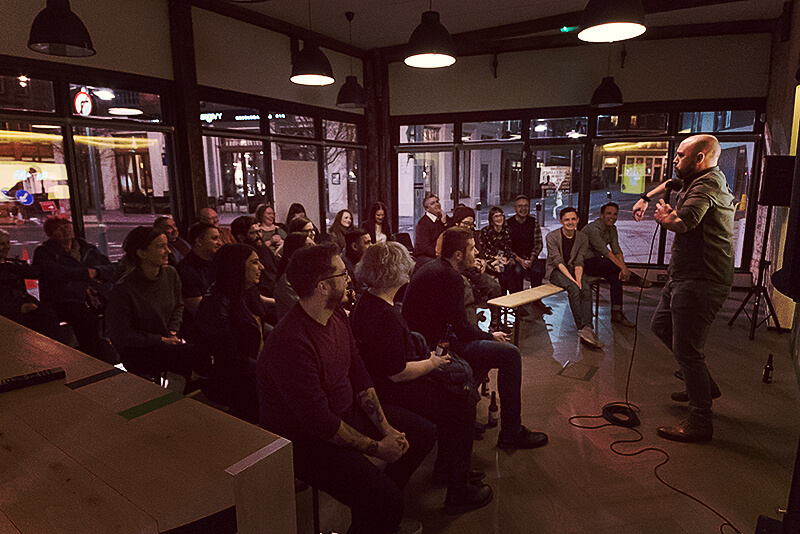 As well as amazing Christmas parties (what would expect from an events agency), occasional meals, trips to the local and competitive salaries, we also hold live comedy shows every 4 months for staff. Sparkle is a 3, 6 or 12 month paid internship programme placing you at the heart of our design team. We’re seeking creatives, from a graduate design background, that are passionate, relentless, fearless and creatively driven. You’ll learn how to develop your own ideas and get expert help to make them happen. We’ll throw you into the deep end, having you work on real client projects with real deadlines. The programme is open to Graphic Designers, 3D Environment Designers and Motion Designers (2D and/or 3D) and is open all year round. Send your inspiring portfolio and CV to matb@somespark.co.uk, and if we like the look of your work you’ll be invited in for a chat.